Looks like she altered one of Big B’s old suits to wear. The red lip is making her face look haggard rather than striking. I can only imagine what a boss babe she would’ve looked like with a messy top knot and a matte mauve/brown lip. Missed opportunity for a great look even though she looks nice. Everytime I look at her, I think, what a waste!! Unless she lives under a rock she must know bad her dressing sense is! It’s not like you have to be stylish, but oh please, you have to presentable atleast….and this applies to us mortals too, leave alone an icon like her. Even with little effort she can look like a million buck and still she chooses to look like this….Please do us all a favor Ash and put in little effort…. Yikes! That’s one horrid mess. Can’t finding one redeeming feature. Jeans and T would have looked way better! Is she in mourning ? Such a mess. I don’t understand why she does this to herself. Even if she wore a a plain tshirt with jeans or a simple salwar suit she could look better than this. She could keep her favorite red lipsticl. Why, God? Why? A simple cotton kurta from Myntra would have been a better choice than this mess. Her stylist (if she has one) is letting her down big time. She looked quite nice? It seems nobody agrees with you here. I feel so bad for the stylist. she can’t even use her muse properly. It took me a while to figure out what the outfit really is.. It’s in stark contrast with the casual vibe that rest of her family was going for. I feel that may be she is aware of the disappointment around her clothes and make up but deliberately continues with them to assert her choice/freedom to dress the way she wants and that she gives two hoots about opinions about her. I recognise a syndrome peculiar to very beautiful women in her – the No Matter What I Do I Still Look Fine. My sister has the same issue-she has a beautiful and striking face so she doesn’t make any effort on presentation or clothes or her body, because she feels that she’s still passable compared to many others. I don’t agree at all and I see it in Ash-she only puts effort into makeup and hides her body. Embrace yourself Ash! If an icon like you can’t do it, how can others? The issue is Aish Rai doesn’t read blogs like these, someone has to knock her door and convey these suggestions. While many others in Bollywood read blogs like these. Even her chikan kurta suit looks… she wears to temples and pujas, don’t look effortless and breezy (from past 7 years or so). She looks clumsy in them too. Her style is clumsy and gaudy. The colour does nothing for her skin tone and the outfit does nothing for her. She could have worn a sack and it would have looked the same! Aishwariya really is so unaware of her body and what works on her – such a shame as she can get away with a lot with a little bit of effort. I thought I had seen this suit before. Rack as I did, my brain couldn’t visualize the image I had in my head. That’s when the other senses jumped in. I remembered bright lights, I could smell the plastic of balloons hovering over the heads. Heads, aha! There were lots of people, for sure. The brain could conjure up the sweet sweet feeling of new hope. And Freedom. That’s right, it was at a rally! And there was definitely a podium. And standing there with a mike in hand and hair that wouldn’t move an inch if the tower of Pisa were to accidentally fall on it, was Mrs. Clinton. In a black beaded suit. With tuxedo lapels thrown in for good measure. You know, coz, power is in the lapels. Ms. Rai – set yourself free. From this kind of dressing. Don’t make an effort at all and I am sure you will look better. Here’s a question – is she unhappy? Like Cara pointed out above, I had the same feeling. This looks more like an embellished karate outfit. I feel dissed!!! :) She only looks good when she goes abroad. Why? As someone else said above, makes you question her mental state – is she happy? 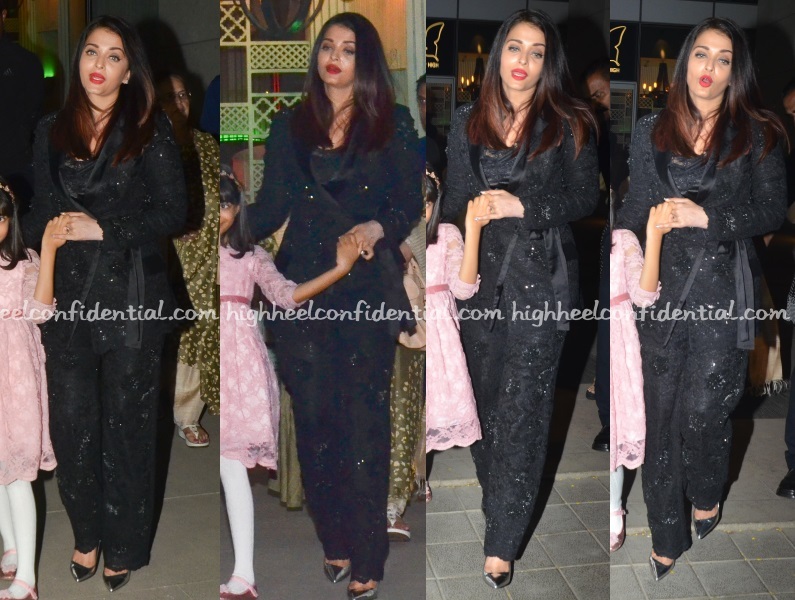 She looks like she is putting in an effort – suits, pricey shiney clothes and makeup and all that but it fails miserably. Almost like she has forgotten herself or what she is capable of. IMO, something is wrong and red lips and awful clothes are a manifestation.